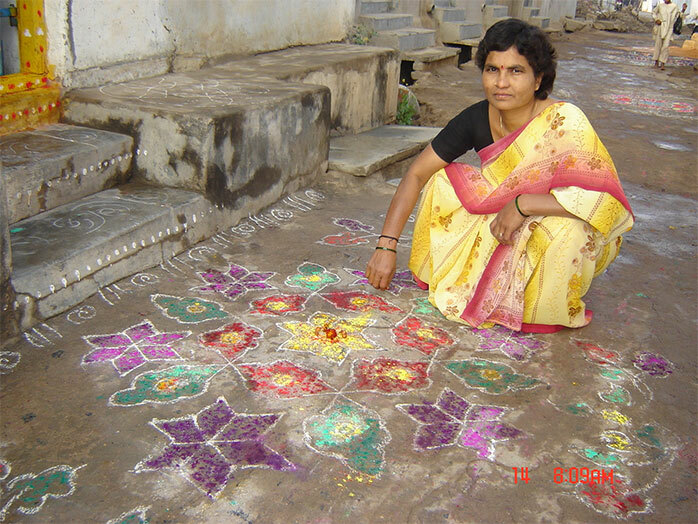 Rangoli in Andhra Pradesh is called as Muggu. 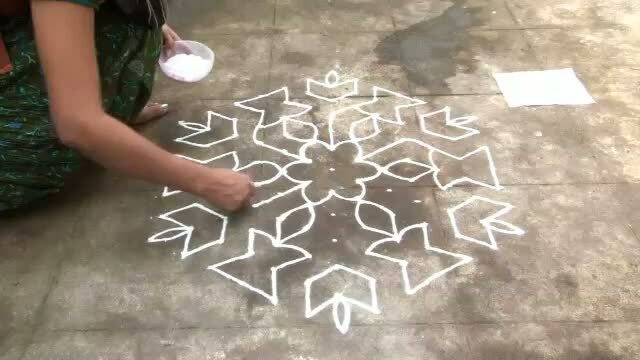 Like in most parts of the country, every morning before sunrise, the women folk clean the entrance to a home and/or the courtyard with water, considered the universal purifier, and the muddy floor is swept well to prepare an even surface. Cow dung is then mixed with water and this slurry is expertly sprayed on the requisite area and spread evenly with a broom. This is done on a regular basis in rural areas, and on festive occasions in certain urban areas, where there is availability of sufficient cow dung, and space to draw the muggu. This procedure is performed as it is believed that cow dung has antiseptic properties and hence provides a literal threshold of protection for a home. The muggu is then drawn on this prepared surface. The dark colour of the cow dung slurry also provides a good contrast for the white powder of the muggu. 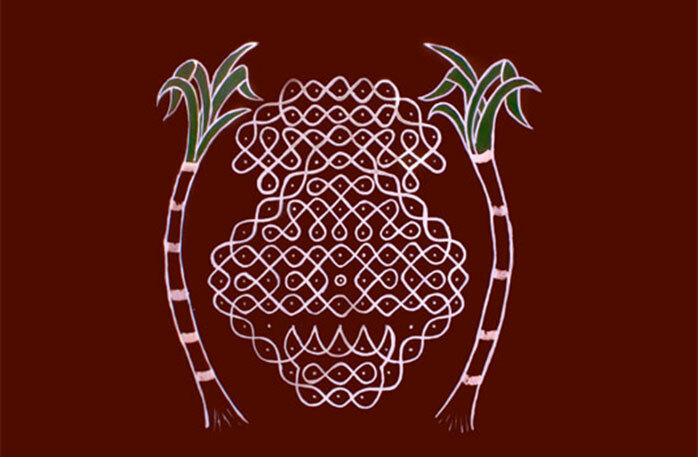 Muggupindi is a mixture of calcium and /or chalk powder which is used for creating these exquisite and unique muggu patterns. It’s a slightly heavy powder that falls thickly across the wet earth and stays in form while being used. As the index finger and thumb clasp a tiny bit of it and start dropping it from half an inch above the wet floor, the white powder falls gently leaving a white trail behind. There is a knack of letting this powder flow smooth and even, as one draws lines and curves of the muggu designs. 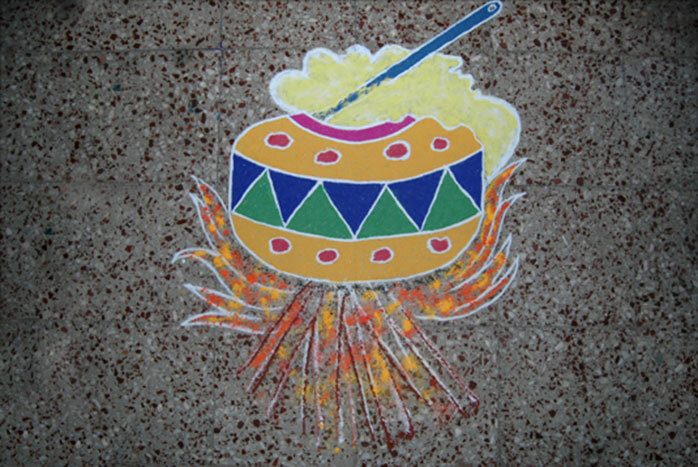 During festivals rice flour is used to create the muggu, instead of the muggupindi as it is considered as an offering to the ants, insects and sparrows that tend to feed on them. 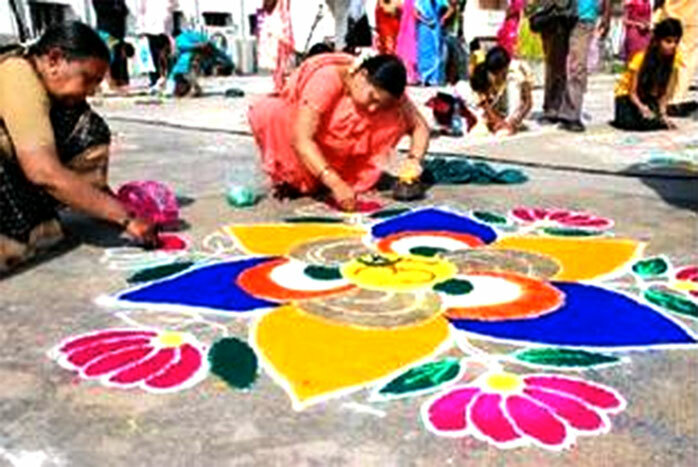 One characteristic of muggu is that it is drawn by commoners. 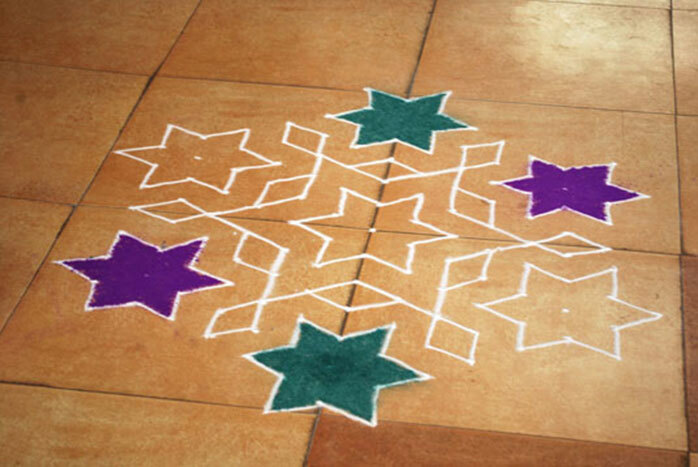 On festive occasions it is drawn in every home. No formal training is required to acquire this art. The art of muggu creation is typically transferred from generation to generation and from friend to friend. 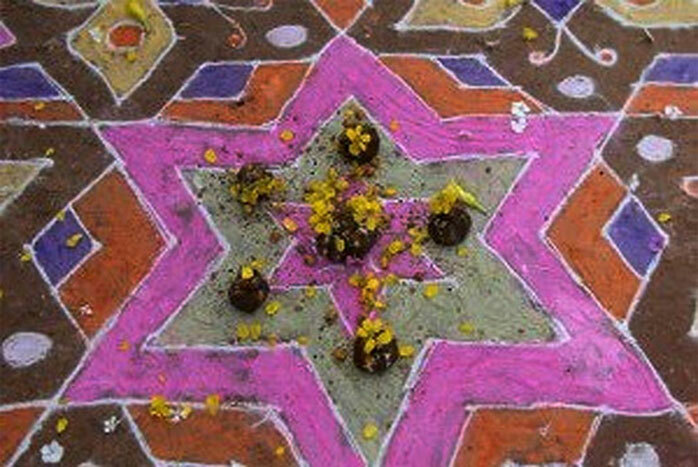 Sankranthi: Every month the Sun moves from one zodiac constellation to another and the day on which the Sun changes the constellation is called Sankranti. Makara Sankranti (usually falls on January 14), the Sun’s movement into Capricorn (Makara) constellation is considered very important, and as it is the beginning of a six-month period of the auspicious time of Sun’s northern course called Uttarayana Punya Kaalamu. 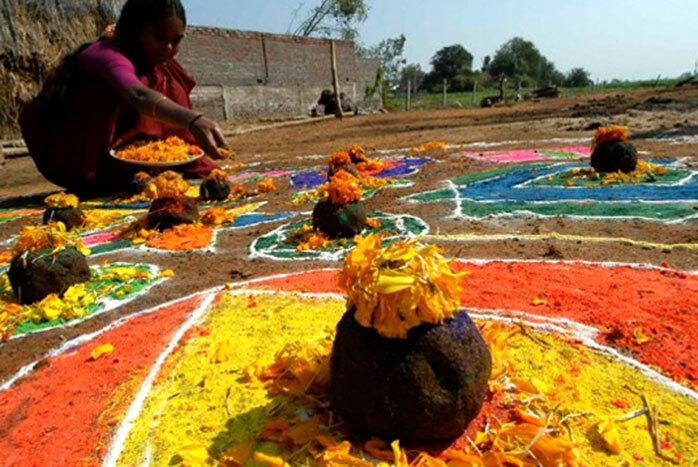 Bhogi is the day preceding Sankranti and Kanumu is the day after Sankranti which are also celebrated on the same scale as Sankranthi. 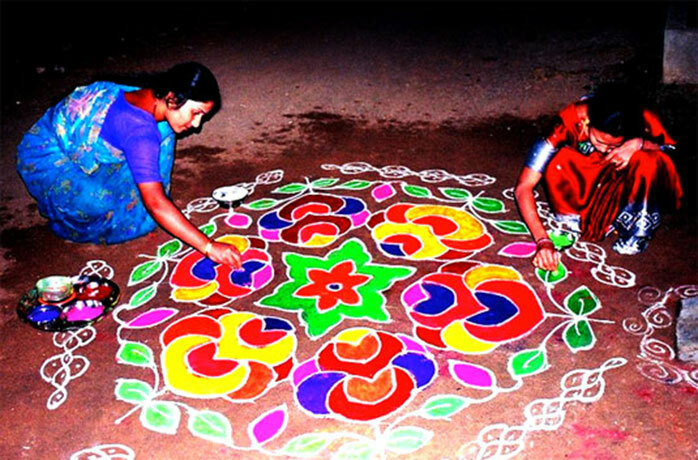 The one month preceding Makara Sankranti is known as Dhanurmaasam. 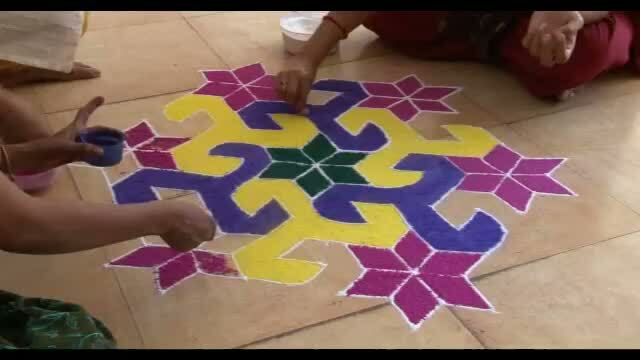 With the advent of the Telugu Dhanurmaasam, the thresholds of every house in Andhra Pradesh - towns and villages are adorned with white and coloured geometrical patterns of muggu. During the entire Dharnurmaasam girls decorate the mungili or vaakili (the entrance to the house) with huge muggulu (designs with sand of lime stone or rice flour, turmeric and kumkuma) with Gobbemmalu (globes made of cow dung and decorated with flowers, turmeric and kumkuma, and incense) in the center, and worship Gobbemma (Goddess) while singing and dancing around the muggu (design). 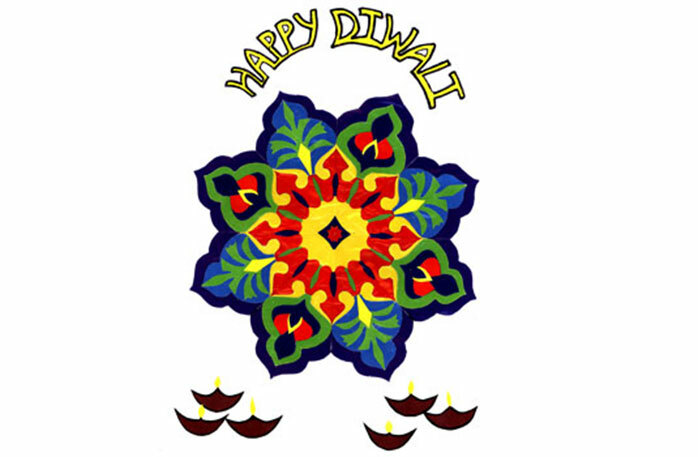 The common belief is that this month is said to be devoted to spiritual thinking. Since cleanliness is considered next to godliness, it is believed that God enters only those households that are clean. It has therefore become a custom to clean the front yard of one's home and lay a decorative muggu as if inviting God to take the first step into the house and bless the dwelling and the dwellers. 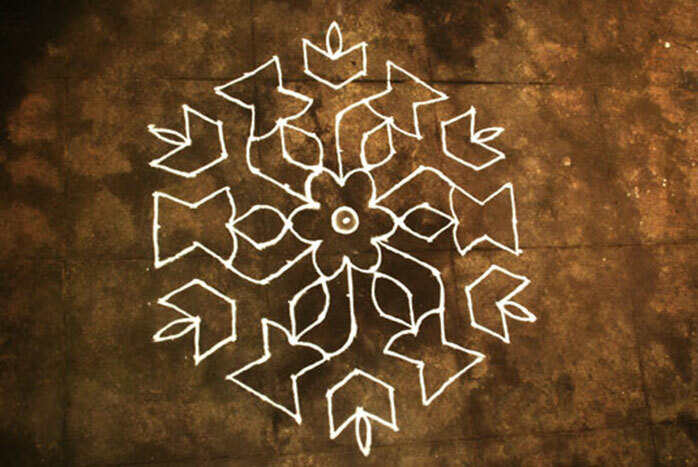 During the harvest season of Sankranti, muggu is a whole month exercise for the women of the house as they put in the extra effort to draw different beautiful patterns in front of their homes, at sunrise. 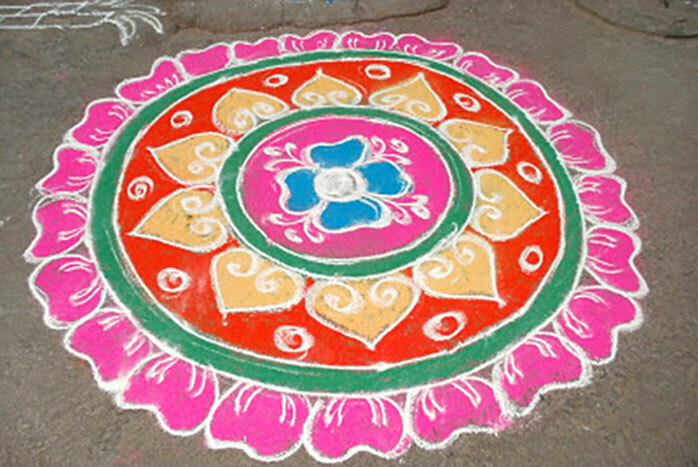 This month prescribes white rice flour to be used instead of the chalk powder for muggu. To this white flour is added a dash of colour in the form of red kumkum and yellow turmeric (pasupu). It is believed that the white colour denotes purity and peace; red represents devotion and love and yellow stands for prosperity. 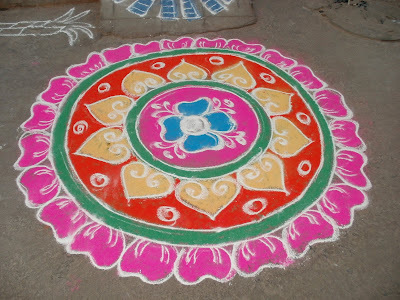 Some of the popular designs drawn during Sankranthi are the ratham muggulu. 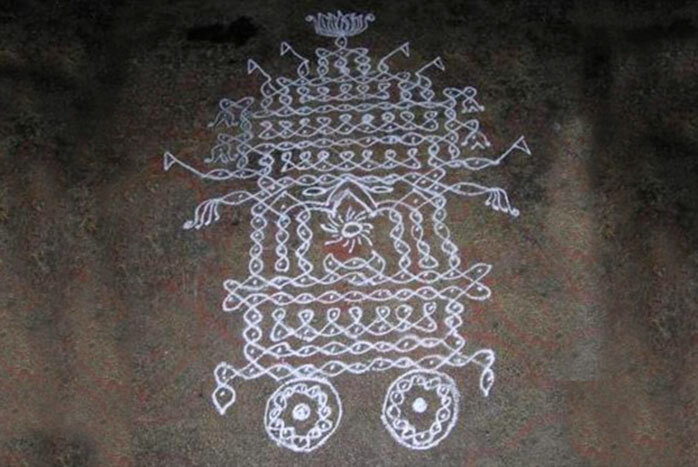 The designs are in the form of lines and take the shape of a chariot (ratham). 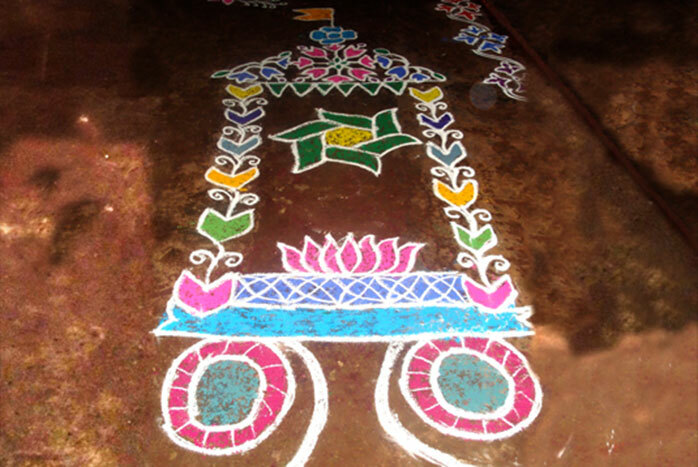 In some homes the size of the ratham / chariot muggu occupies the entire front yard on the first and second Sankranthi days (Bhogi and Sankranti). The chariot represents the Sun God - giver of light and energy to the earth and its inhabitants. Also, this represents the journey of the sun is from south to north (the onset of Uttarayanam) according to our geography. 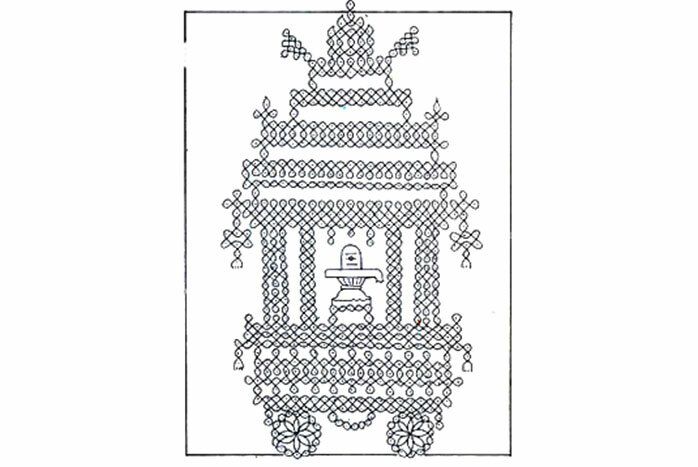 Since the festival celebrates the harvesting, all the symbols and figures in the muggu indicate and represent the same like the sun, the crescent moon, the sugarcane branch, coiled serpent and a pot with mango leaves placed in a specific pattern at the mouth of the pot, called the kalasham (a symbol of wealth and health) around the four corners of chariot muggu. 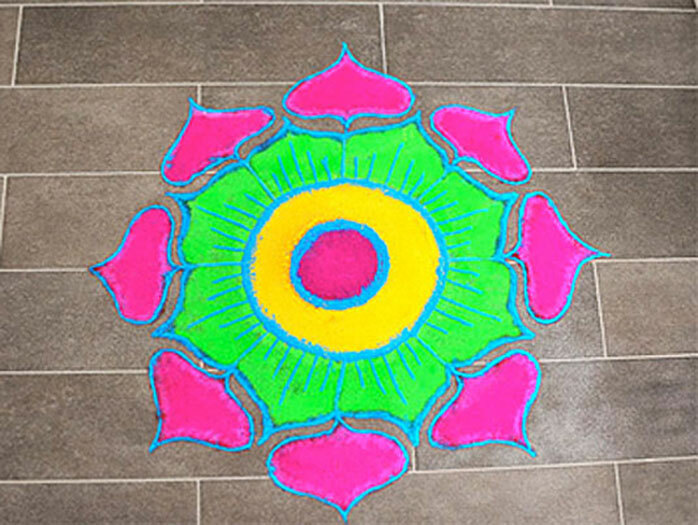 On important festival days such as Deepavali, Navaratri, Ganesh Puja, Varalakshmi Vratam day, or Ugadi, the muggu drawn has occasion specific designs and more effort is put in by the women of the house hold in creating them like in creating Sankranthi muggulu. 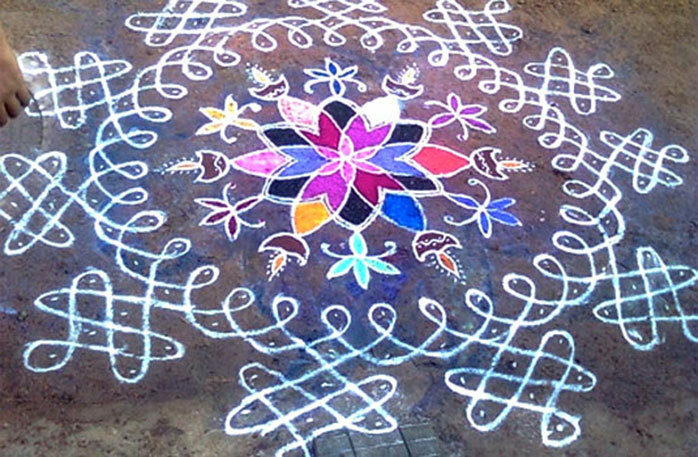 The patterns of muggu are very complicated and huge during festival months. 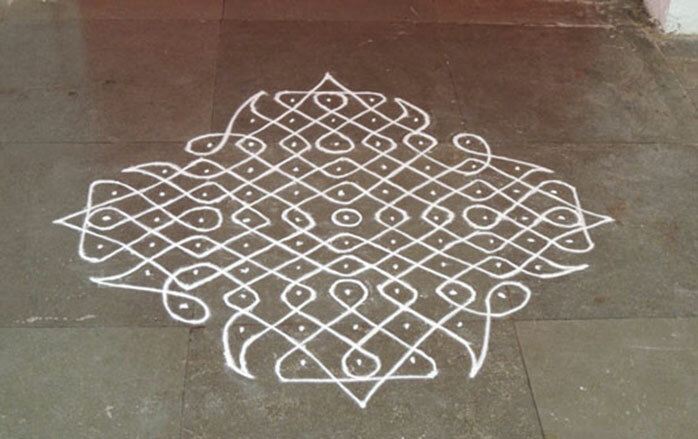 The temples too are decorated with these patterns and are considered as painted prayers. 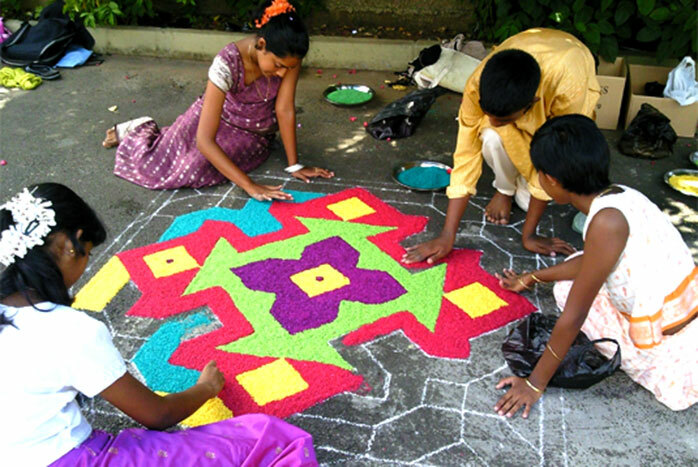 The temples usually have complex patterns that cover thousands of square feet and several women together create these, thus bringing in the spirit of team work and speed. The muggu consists of geometrical patterns or dots, which are joined by lines or curves that have a mathematical calculation. By this one understands and infers that ancient Indian women had artistic traits combined with a sense of arithmetic, which they showed in the drawing patterns of the muggu. 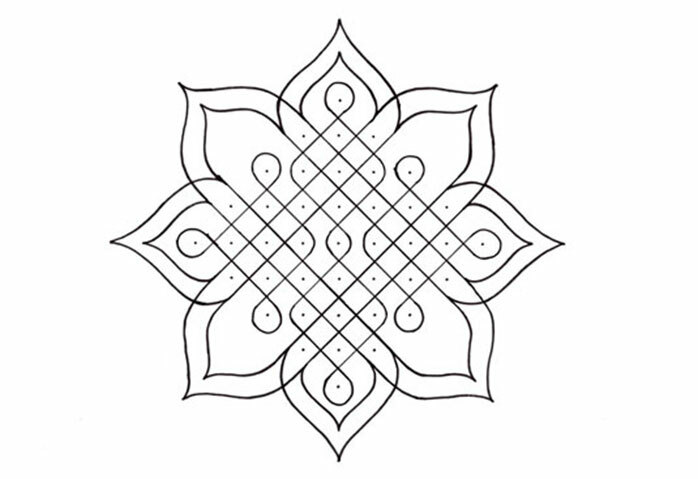 Dots are arranged in a specific sequence, in a matrix form equidistant from each other and these dots are joined either by lines or curves to create different muggu designs. 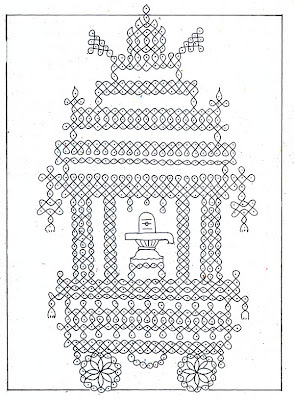 Some hand sketched examples of the chukkala muggus on paper. 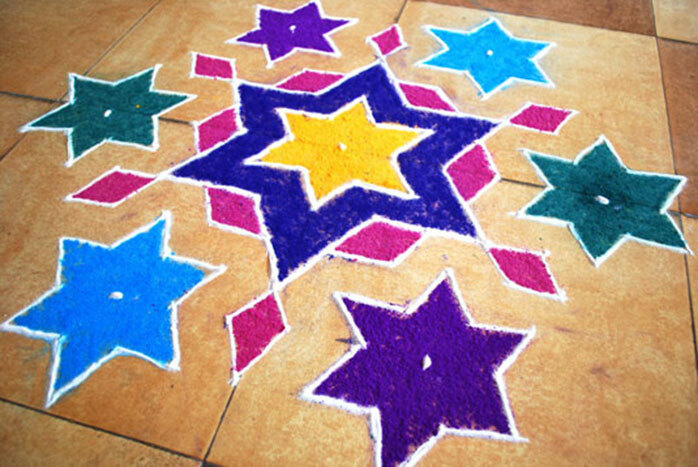 Stars are created with white muggu powder in a matrix of dots, which are filled with coloured rangoli powder, later. 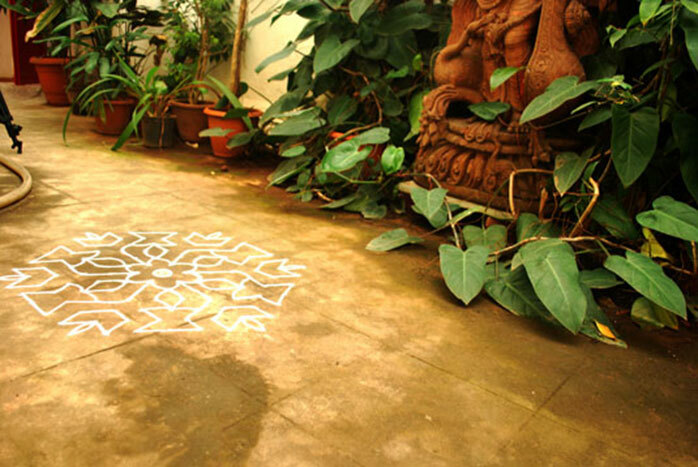 A chukkala muggu in plain white muggu pindi (white rangoli powder )created in the courtyard of a home. 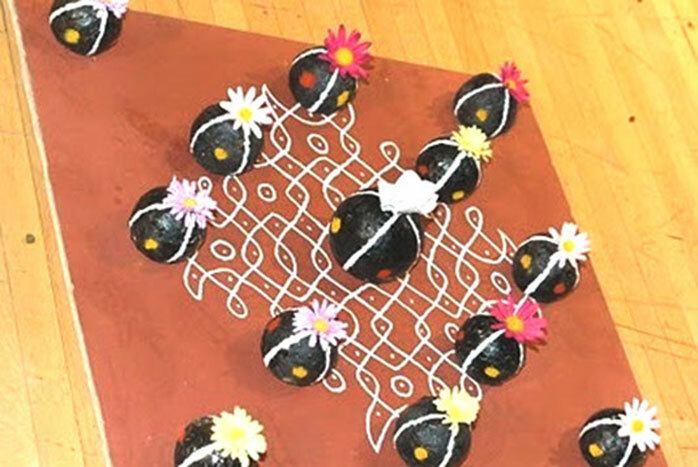 The following video shows the creation of one such chukkala muggu. 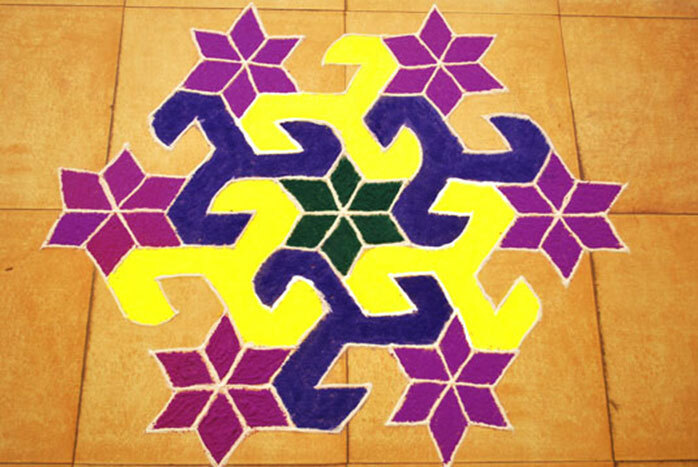 Sometimes after the creation of the basic muggu in white muggu pindi (white rangoli powder), various coloured rangoli powders are used to fill in the pattern to create a decorative look for special occasions. 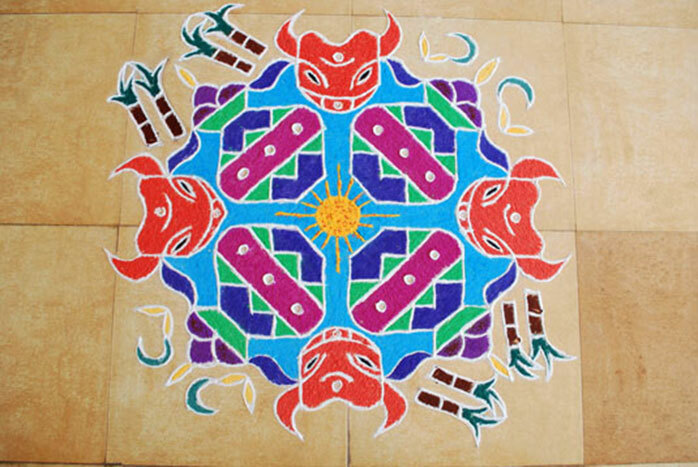 The following video shows the creation of one such coloured chukkala muggu. 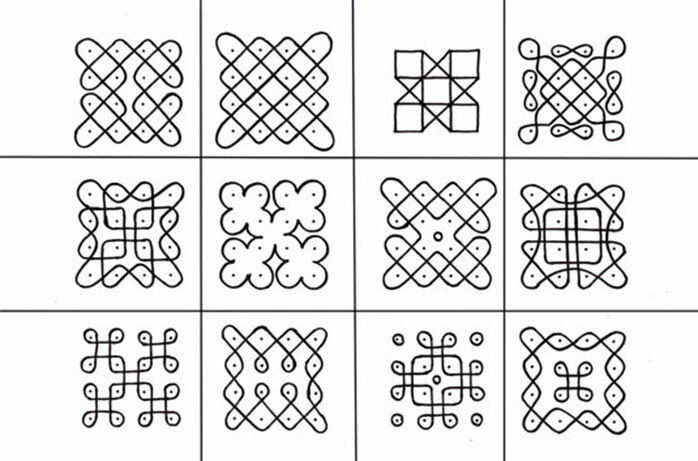 These designs are made without dots. 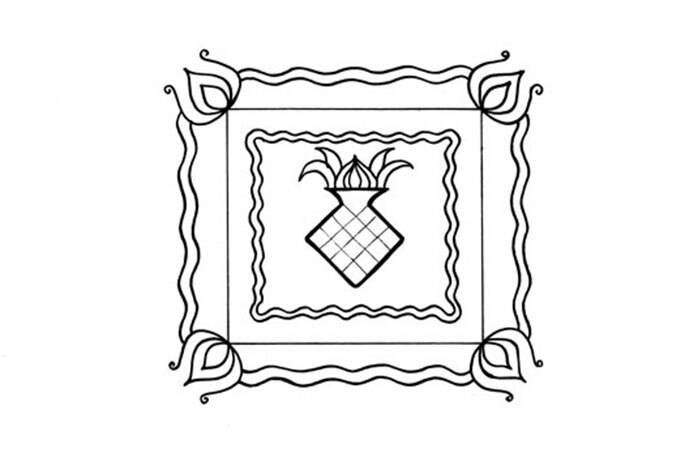 They are similar to free hand drawings of lines and curves, but use occasion specific elements to make different muggu patterns. A basic matrix of dots, equidistant from each other is created first. Then twisted chains are created around the dots in an expert fashion to create exquisite, symmetrical muggu patterns. Simple versions of any of the above types are created daily in households. A creative combination of all these types is used during festive occasions.